Seen from their summits almost all mountain shadows look triangular regardless of the mountain's shape. This is a perspective effect. You are standing at the top edge of a long tunnel of shadowed air and looking along its length. The tunnel's cross section is the shape of the mountain but its "end" is so far away that it looks insignificant. The finite size of the sun also causes the umbral (fully shaded) parts of the shadow to converge and eventually taper away. The tapering sets limits to the umbral length of shadows. That of the Earth is over a million miles. That of a high mountain can be two to three hundred miles. 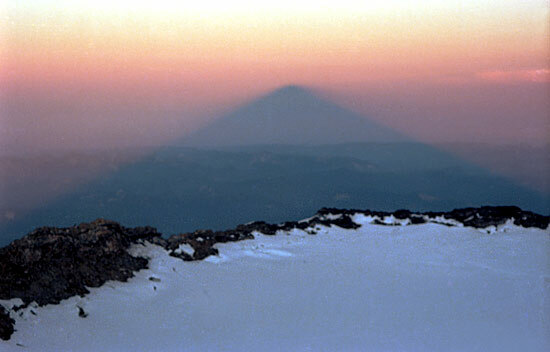 Triangular shadows are not seen from objects much smaller than mountains because their shadows are not long enough.